Sophia Wilansky, a 21-year-old water protector from New York City, faces arm amputation after being hit with a concussion grenade she says police threw at her intentionally. A water protector who was present during the recent violent police response to protesters at Standing Rock in North Dakota is facing arm amputation after a concussion grenade thrown by police reportedly hit her left arm Sunday, Indian Country Today Media Network reports. 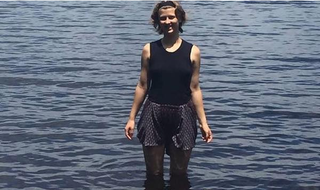 Sophia Wilansky, 21, of New York City, was headed to bring water to water protectors who were under attack for several hours by Morton County Sheriff forces Sunday when the incident occurred. As previously reported on The Root, resistance to the $3.8 billion pipeline has been strong from the beginning. The Standing Rock Sioux tribe argues that pipeline construction is desecrating sacred ancestral lands and that the pipeline itself endangers the Sioux’s major water suppliers: Lake Oahe and the Missouri River. Demonstrations in North Dakota have been going on for months and have resulted in a construction halt in the area immediately surrounding Lake Oahe. Recently, the company constructing the pipeline said it would move ahead with plans to drill under Lake Oahe. According to ICTMN, the Morton County Sheriff’s Office has stated that Wilansky’s injuries are the result of a propane explosion that it claims the unarmed protesters created. That claim is refuted by Wilansky and several eyewitnesses who reportedly watched police deliberately throw concussion grenades at unarmed people. The report says that grenade pieces were removed from Wilansky’s arm during surgery and are being saved for later legal proceedings. Friends have set up a GoFundMe page to help Sophia Wilansky with her recovery and medical expenses. Read more at Indian Country Today Media Network.